Backstory: For the book Michelle and I are working on together, we’re writing alternating first-person viewpoints. She’s writing the girl (Cloudy) and I’m writing the boy (Kyle). So, hey! Look what I saw this weekend as part of my Kyle research! Yes! 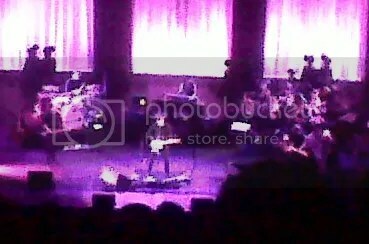 Death Cab for Cutie was at the Paramount in Seattle! And I went! For Kyle’s sake! You see, part of my writing process involves choosing music that can help me to better channel my characters. It’s Very Serious Business, this whole finding-my-character’s-voice thing. When things are going awesomely with a manuscript, I might be able to get away with listening to lots of band while I’m writing, as long as they fall into a particular genre. When I’m struggling, I might have to listen to one song on repeat for days on end. It can be kind of rough (especially when that song is “See You Again” by Miley Cyrus), but isn’t as dreadful as it sounds. Really! But when I’m only a few chapters into a project (like I am with this book) I usually allow myself to listen to songs performed by only one band/artist until I feel that I’ve completely found my character’s voice and can branch out. 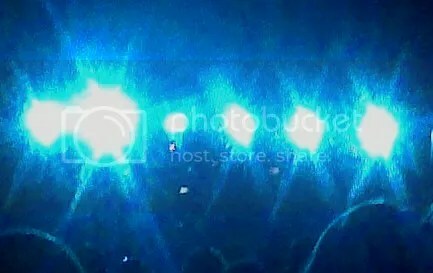 For Kyle, that one band happens to be Death Cab for Cutie. It’s all Death Cab all the time around here, even when I’m not writing. 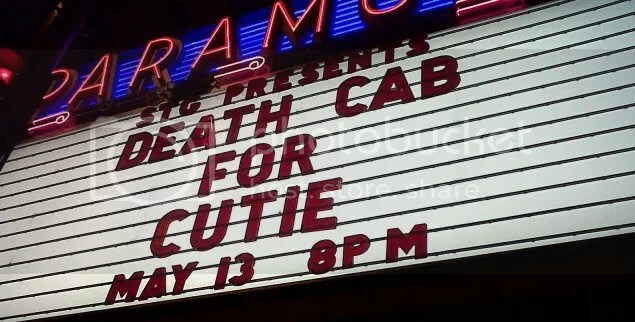 Which means that when I found out Death Cab would be playing in Seattle, I had no choice except to make sure that I was there, right? At this point, I can kind of map out Kyle’s emotional progression that I imagine will take place during the course of the story with three specific Death Cab songs. (I think there is a fourth song that should be in the mix, but I haven’t uncovered it yet.) Last night, Death Cab, along with the Magik*Magik Orchestra, performed two of those three songs, and it totally brought tears to my eyes. Yay for fun and inspiring outings that I can call “character research”! We have a blog! It’s new! I listened to that Miley Cyrus song, like, four times yesterday! I was strangely nostalgic for the TWO SONGS TOTAL that I was able to listen to while writing Coley and Reece’s scenes in Live Through This. I am totally obsessed with “I Will Follow You Into the Dark” right now. And I think of you any time I hear “Me and Bobby McGee” now because of FAMJ. Also! I actually listened to “Me and Bobby McGee” the other day because I’m attempting to put together a proposal for a new book that would be about Carah and Bobby! If it ends up happening, it would be totally alternate-universe FAMJ, but you’d recognize the characters, I think.